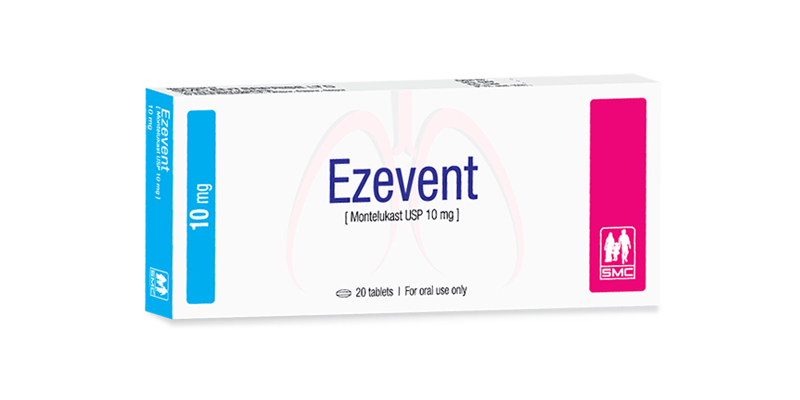 Ezevent tablet: Each film-coated tablet contains Montelukast Sodium USP 10.40 mg equivalent to Montelukast 10 mg.
Montelukast is a selective and orally active leukotriene receptor antagonist that specifically inhibits cysteinyl leukotriene receptor. Montelukast is indicated for the prophylaxis and chronic treatment of asthma. It is also indicated for the relief of seasonal allergic rhinitis in adults and pediatric patients and exercise induced bronchoconstriction. Adults and Children (over 15 years): 10 mg once daily in the evening. Exercise Induced Bronchoconstriction: 10 mg tablet at least 2 hours before exercise. Montelukast appears to be well tolerated. The most common adverse effects reported are headache, rash, dyspepsia, dizziness, edema, tremor, suicidal thoughts and abdominal pain. Pregnancy: Montelukast has been assigned to pregnancy category B. It should be used during pregnancy only if clearly needed. Lactation: It is not known if Montelukast is excreted in human milk. Pediatric use: Montelukast has been studied in pediatric patients (2 to 14 years of age). Studies have shown that Montelukast does not affect the growth rate of pediatric patients. Hypersensitivity to Montelukast or any component of this product. Do not prescribe Montelukast to treat an acute asthma attack. Patients with known aspirin sensitivity should continue to avoid aspirin or NSAID agents while taking Montelukast. Montelukast may be administered with therapies routinely used in the prophylaxis and chronic treatment of asthma. In drug interaction studies, the recommended clinical dose of Montelukast did not have clinically important effects on the following medicinal products: theophylline, prednisone, prednisolone, oral contraceptives, terfenadine, digoxin and warfarin. Caution should be exercised, particularly in children, when Montelukast is co-administered with phenytoin, phenobarbital and rifampicin. Ezevent tablet: Box containing 2x10’s Montelukast 10 mg tablet in blister pack.